Avery Brewing is renowned for their experimentation with high gravity beers and Belgian styles. Additionally, they specialize in a variety of barrel-aged beers ranging from Bourbon barrel beers to sours. If, like me, you’re a sour beer fan, you really must get to Avery’s sour festival in Boulder, CO. I had the pleasure of attending this last summer and had an amazing time trying some wonderful sour beers from around the country. It should be on your list of festivals to hit. 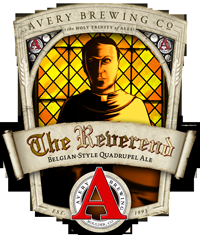 The Reverend would certainly fall into the category of high gravity Belgian-style ales. It’s an Abbey-style Quadrupel ale. Appearance: Mahogany brown, tan head, good retention. Aroma: Banana, cinnamon, rum, caramel, dark fruit, dried fruit. Taste: Pepper, clove, caramelized bananas, candi sugar, spicy finish. Overall Impression: This is a good American interpretation of a Belgian-style quad. If you wanted to compare it to any of the Trappist beers, it would very closely align with La Trappe Quad. Like La Trappe, It’s slightly lighter in color than most quads with the corresponding flavors being “lighter” than darker quads. It’s a really nice beer to share with a friend on a cool evening. Availability: Available year round at bottle shops in states where Avery is distributed. Here is a link to their list of states and distributors.